Kinder Morgan has illegally started construction on their pipeline expansion project without permits, placing seven fish spawning deterrents in BC rivers. The purpose of these deterrents is to take away spawning habitat from chinook salmon, the primary food source of our iconic southern resident killer whales, and other fish species. Chinook are the key species to saving this population from extinction. Chinook stocks are at historic lows, and southern residents are literally starving to death. The construction is entirely unauthorized: Kinder Morgan installed these spawning deterrents before having National Energy Board authorization or Water Sustainability Act permits. The technique used is unproven: the professional biologist overseeing the installation of the deterrents has said that “this is a relatively new science, without a body of supporting evidence for its success.” The impact on chinook spawning is unclear, and this same company-paid biologist is the person responsible for assessing and reporting on the success of this technique. Kinder Morgan has proven themselves a bad actor: they broke the rules, and then asked the National Energy Board to exempt them from what limited oversight the NEB provides. Now they stand to benefit from their illegal construction: the spawning deterrents were in place before chinook spawning season, and the lack of chinook would allow the company to build outside the window of least risk to fish. To date, there have been no penalties assessed by the NEB. But even if they had followed the rules, the level of project oversight is shockingly low. Kinder Morgan themselves decide and report if they have seriously harmed fish, with self-assessments conducted by the project biologist responsible for the spawning deterrents. This controversial project must have a higher level of scrutiny than what the National Energy Board is providing. 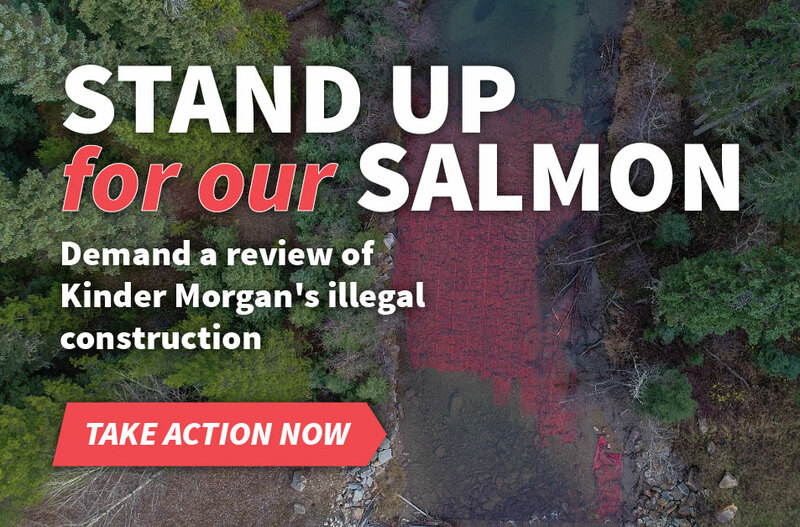 We need BC’s government to stand up for our interests and conduct a review of Kinder Morgan’s illegal construction. This demonstrates it’s time to press pause on this project, examine what happened here and how the rules must change so something like this cannot happen again. This action is now closed. Sign up for our email list or Facebook page for future opportunities to defend our coast. Georgia Strait Alliance would like to thank Lynn Perrin of the Pipe Up Network, Ian Stephen of Waterwealth and Dogwood BC for their work on this issue.